'S e fear de na ceàrnaidhean as motha anns an Spàinn a tha ann an Andalusia (Spàinntis: Andalucía). Thàinig an t-ainm bhon fhacal Al-Andalus, b' e sin an t-ainm a bha air eadar 711 agus 1492. Tha e suidhichte ann an ceann an iar-dheas na dùthcha. Tha a' Phortagail agus an Cuan Siar san àird an iar dheth. Tha am Muir Meadhanach san àird an ear agus tha Giobraltair san àird a deas Andalusia. 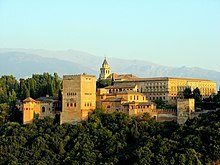 'S e Andalusia an ceangal nàdarra eadar Afraga agus an Roinn-Eòrpa. 'S e Andalucia an dàrna cheàrn as motha a tha anns a' Spàinn. Tha e cho farsaing ri 87,268 cilemeatair ceàrnagach. Anns a' bhliadhna 2007 bha 8,059,431 duine de shluagh ann, le dluths aig àireamh 91.39 duine gach km². Tha trì puirt-adhair eadar-nàiseanta ann (Almería, Málaga is Sevilla). Cuideachd tha port-adhair nàiseanta ann an Granada agus Jerez.Tha i na Coimhearsnachd fèin-riaghlaidh fo smachd an Junta de Andalucia. Tha pàrlamaid le ceann-suidhe agus Buidheann Riaghlaidh aige. Tha ochd sgìrean ann an Andalusia. Tha cruth na tìre gu math eadar-dhealaichte an seo. Tha monaidhean àrda ann a tha còmhdaichte ann an sneachda fad na bliadhna. Ach tha oir-thìrean tropaigeach, coilltean tais agus fàsaichean ann cuideachd, m.e. : am Fàsach Thabernas, a tha suidhichte anns an sgìre Almería. Medina Azahara ann an Córdoba. Air a tharraing à "https://gd.wikipedia.org/w/index.php?title=Andalusia&oldid=541898"
Chaidh an duilleag seo a dheasachadh 22 dhen Ghiblean 2018 aig 20:16 turas mu dheireadh.